The Mobius ActionCam is one of the most sophisticated mini cameras around. 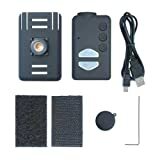 At 2 x 1 x 1 inches and weighing a little over 1 pound, this camera can easily fit in any pocket, but press record and you will capture stunning HD video quality normally only found on devices 5 times the size. 1080P HD Video Quality The Mobius can record in gorgeous 1080P H.264. HD video quality at 30 frames per second. At the highest video quality, the bit rate will be nearly 18,000 kpbs in wide angle recording. There is also a 720P 60 frames per second option suitable for extremely fast action recording, and WDR (Wide Dynamic Range) recording for low light scenarios. A Time Lapse mode, where the camera will automatically take Time-Lapsed still images is also included. Battery Life The Mobius can record for approximately 80 minutes at a time. Add a power bank (not included) to increase the battery life. The Mobius is capable of recording live video while plugged in as well. Audio Quality The Mobius records audio with 3 volume settings at 512 Kbps PCM (CD quality). Use it as a Car Camera With the car mount and car adaptor (not included), the Mobius makes an effective dash cam. As soon as the Mobius is plugged into the car power adaptor it will start / stop record based on driving, no need to press record. With the Mobius’ video quality and wide angle view, you can read any license plate on the road with ease. Mounts and Accessories Included with the Mobius is an attachment sleeve, a Velcro mount and a USB cable. Optional accessories include: bike handlebar mount, car mount, mini tripod, car adaptor, and helmet mount & waterproof case (coming soon! ).